As April brings us warmer weather, the mosquitoes follow! Mosquitoes can bring dangers to our cats and dogs in the form of heartworms. 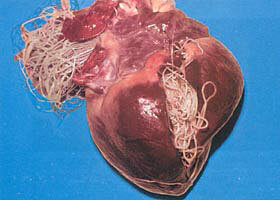 Pictured at the left is a heart filled with what looks like spaghetti. What you are seeing are actually dozens and dozens of heartworms, which surely killed this animal. Dogs and cats are at risk of contracting immature heartworms from a single mosquito bite. Infection is common in this area and is much easier and economical to prevent instead of treat. Treatment is very hard on the animal and includes arsenic-based injections, lots of pain, and cage rest for months. It is very dangerous to the pet that must go though it. On the other hand, heartworm preventatives are given monthly, as a topical or oral medication. Heartworm prevention costs only $6.80 – 11.70 per month, depending on the weight of your animal. This totals to only $81.60 – 140.40 per year. Compare this to the cost of treating a heartworm infection: at least $1,000 to $2,000 dollars!! In Ohio, we recommend year-round heartworm preventatives. This is not only important for heartworm prevention, but these medications also include preventatives for intestinal worms including roundworms, whipworms and hookworms. If you buy a year’s worth of prevention at the same time you save money in the long run with rebates. For more information, visit the American Heartworm Society’s webpage or give us a call! !